Loranthus micranthus, "Small-flowered mistletoe", Tupeia antarctica, "Mistletoe", Alepis flavida, "Yellow mistletoe", Peraxilla colensoi, "Scarlet mistletoe" (Loranthaceae). The alternative spelling (closer to the Greek derivation) of the generic name Ripogonum (Rhipogonum) is used in some reference works; similarly the small-flowered mistletoe Loranthus micranthus is controversially also referred to as Ileostylus micranthus. Alternative Māori names for pirita as the supplejack liana are kareao, kakareao, karewao, kekereao, akapirita (see link below), and taiore. The newly-ascending shoot is known as kotau, and a thicket of pirita has the collective name taeo. 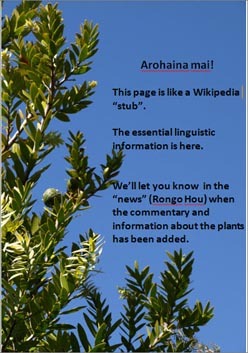 The first three mistletoes mentioned above, Loranthus micranthus, Tupeia antarctica, and Alepis flavida are collectively known by the heritage name pirita and local name pirinoa ("constantly clinging"); the small flowered Loranthus is also known as pirirangi, pikirangi "clinging or climbing to the sky". Tupeia antartica is also known as kohuorangi ("mist of heaven") and tāpia. The flowering scarlet mistletoe (Peraxilla colensoi) seems to have been known only as pirita; the inflorescence and the tree hosting it were termed korukoru. Akapirita ("Pirita vine"), an alternative name for the suplejack combining two heritage terms. Watch this space! This page is still very much under construction. However, it contains the essential linguistic and botanical information, to which both text and pictures will be added progressively as soon as time permits. See the first item on the "News" page for more information. Like its tropical namesake, the pirita / supplejack grows rapidly in warm weather, quickly climbing towards the canopy of the forest once it finds a tree. Once it has found the light it branches out like its local namesakes, the mistletoes, which as epiphytic parasites have been saved the trouble of climbing and finding their own food. References and further reading: There is an interesting and well-referenced entry for Ripogonum scandens in Wikipedia. 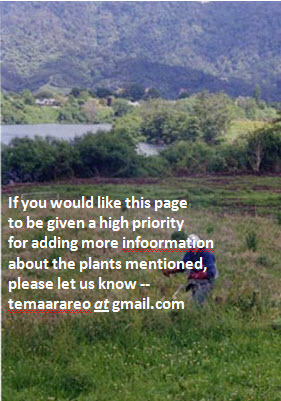 See also linked pages and general works on NZ plants in the bibliography.